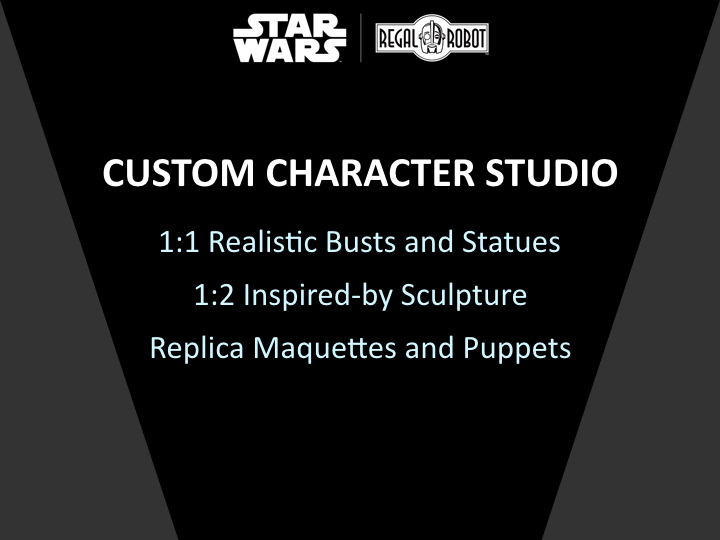 Home / News / Introducing the Regal Robot Custom Character Studio & Upcoming Star Wars™ Creations! Add character to your space! We are excited to announce that our STAR WARS™ CUSTOM CHARACTER STUDIO is now live! Visit today and learn about our upcoming Limited Edition Life Sized Chewbacca Bust and Tauntaun Maquette Replica – Phil Tippett Signature Edition. In addition to our current limited edition offerings, fans will now have the unique opportunity to commission a CUSTOM CHARACTER from the Star Wars films! These could take the form of a replica maquette or puppet, or even a life-sized figure or bust of their favorite creature, droid or alien! To inquire about commissioning a custom sculpture, you can use the form at the bottom of this page, or the one on the Custom Character Studio page. “As a young artist, the incredible array of aliens, creatures and droids in the Star Wars universe inspired me to no end. It still does today! The creative work of the teams behind the scenes on these films made me to want to recreate these characters and eventually helped me become an FX artist and sculptor. Each beast or creature, no matter how small, was fascinating to me. I obsessed over the design of the obscure ones that lurked in the shadows of the cantina and Jabba’s palace (as anyone who’s attended my panels at Star Wars Celebration can no doubt attest!) and their creators became my heroes. Over the years my team and I have had the opportunity to recreate the cantina many times for commercials and official video projects, each time excitedly adding new characters to our roster. Now, we’re bringing those years of research and our sculpting skills to this new endeavor. In addition to our new limited-edition busts, statues and maquettes, we’re going to be giving collectors a truly unique opportunity… the chance to commission their own official Star Wars sculpture creations, allowing us to explore not just prominent characters, but all those really fun ones who maybe didn’t quite get the spotlight we hoped they would! Our new Star Wars sculptures can draw from any of the Star Wars theatrical releases and we can also interpret concept art and paintings, or recreate maquettes and conceptual sculptures, making that galaxy of inspiration that much bigger. Our first limited edition pieces will be a life-sized bust of Chewbacca the Wookiee, and our replica Tauntaun maquette – Phil Tippett signature edition based on the concept sculpture from the production of Star Wars: The Empire Strikes Back. These pieces will be available in just a few months and you’ll find some teaser images of each below! Sign up for our newsletter if you’d like to know when these are available for order! We’re excited to share all of our upcoming sculptures and products with you. Enter your email below to join our newsletter and we’ll let you know about all of these new creations as we release them! Our amazing custom service is already up and running and we have several very cool projects in the works for Star Wars super fans right now. If you’d like to request your own custom character sculpture, use the form below the images. Thanks for reading! A few of the new types of creations we’re now offering! 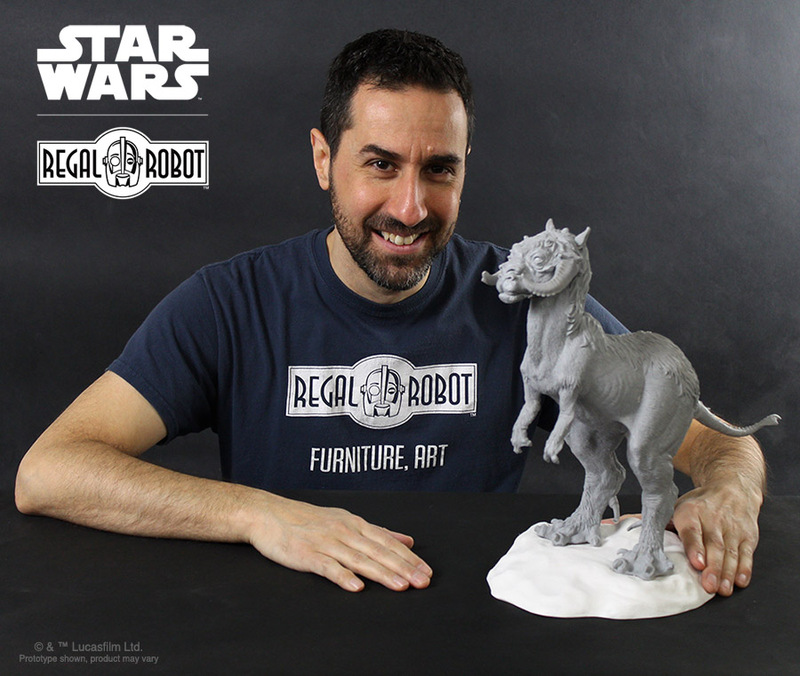 Regal Robot founder, Tom Spina, with our prototype Tauntaun Maquette Replica. Working with masters from the original molds, we’re recreating the Tauntaun maquette from the production of Star Wars: The Empire Strikes Back! 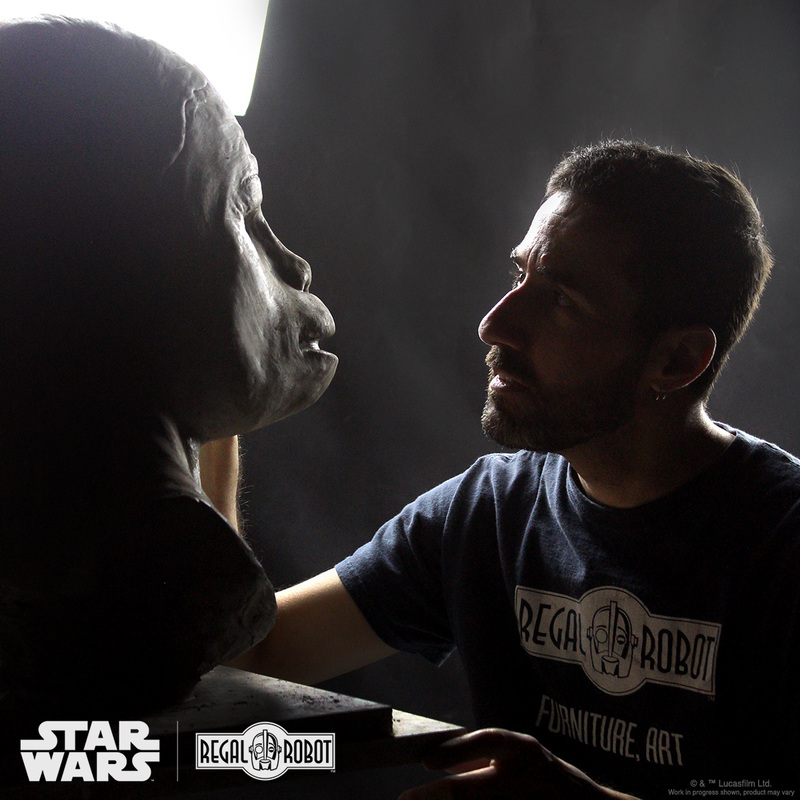 Sculptor and Regal Robot founder, Tom Spina, working on the sculpture for our life-sized Chewbacca character bust. 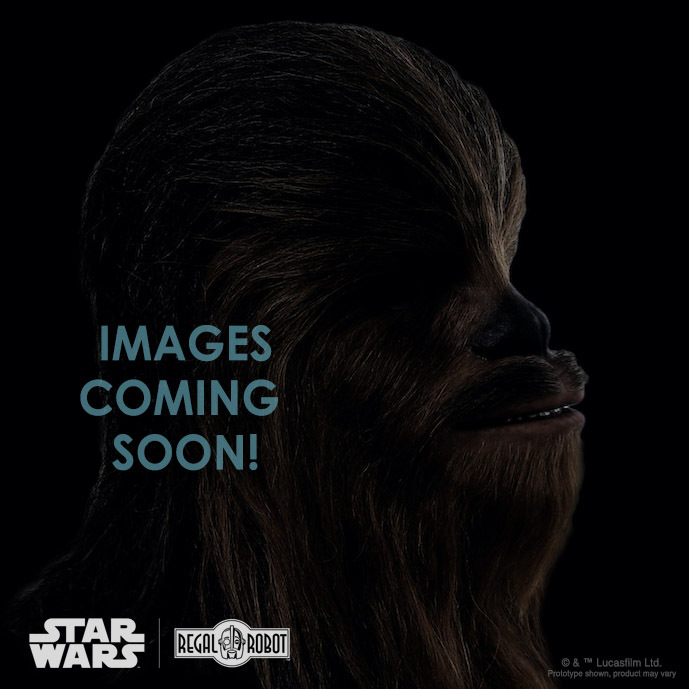 Our limited edition life-sized Chewbacca bust will be released in just a few months and we’ll have more images soon! Join our mailing list and be the first to know when it’s available! 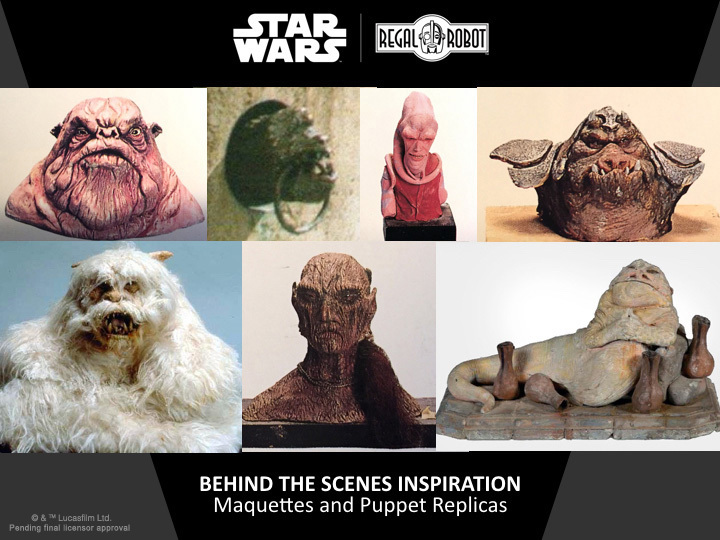 We find endless inspiration in the creatures, droids and characters of the Star Wars galaxy! Let us create a custom character for you! Want to request your favorite alien, droid or character? 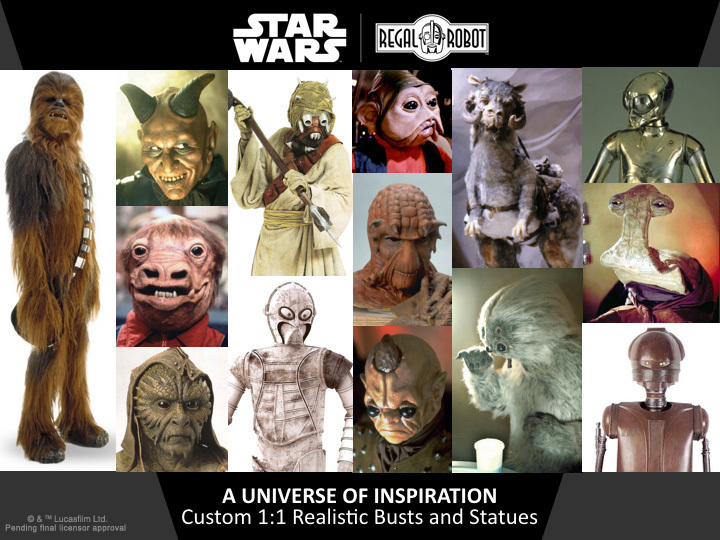 Use this form to request a your own custom Star Wars character bust, life-sized statue or maquette! Please note – due to the time involved in developing custom creations, we can only take a limited number of these projects each year. Submit your custom request by filling out the form below to begin the conversation and learn what we can create for you!